Who was, and whatever became of, the early nineteenth century Swedish movie actress Mary Johnson? Good questions. 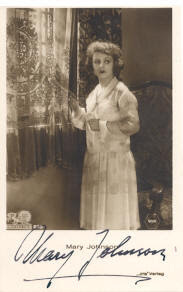 Born in the late 1890s, she appeared in her first film in 1913 and retired in 1931, in her mid 30s. She would live another four decades, dying in May of 1975. 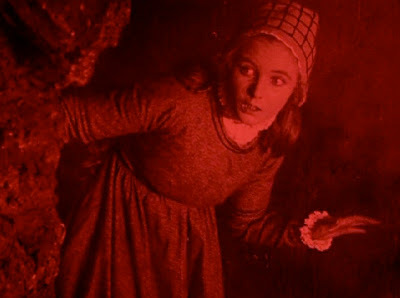 She is virtually unknown to modern cinema viewers, and in 2010, her name is not exactly Google friendly. I know of her only due to her brief appearance in archival footage in the stellar 1995 documentary "Cinema Europe: The Other Hollywood," narrated by Kenneth Branaugh. There is little about her on the Internets (save for the foreign language article depicted above which, or course, I am unable to read). In this post, I've cobbled together about as much information and imagery on Ms. Johnson as I could locate on the Internets (including a few screencaps from the Cinema Europe documentary, which featured footage from Johnson's film, 1919 film Herr Arnes pengar (a/k/a Sir Arne's Treasure of The Treasure of Arne) which featured Johnson in the role of Elsalill. (Believe it or not, that film is available on DVD.). See "Archives" (Institut Jean Vigo, Perpignan, France) n°60, février 1995 : "Mary Johnson, le trésor d'Arne" par Thierry Lefebvre. MARY JOHNSON, OUR INNOCENT YOUNG SWEDISH ACTRESS, IN FRONT OF THE CAMERA. 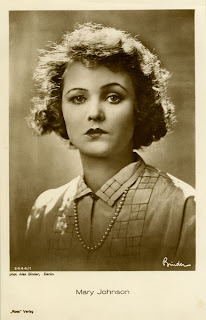 There is a sizeable number of film roles Mrs. Mary Johnson have had time for, without having so much as a grain, of this delicately girlish, of this almost old-fashioned slender and young, which is her hallmark, volatilized or solidified. When faced with her Ingrid in "Gunnar Hedes Saga" (The Blizzard), looking back on Swedish film repertoire, one sees the role her personality plays in the lyrical that so often characterizes Swedish books and Swedish visual arts. She started in "Mästerkatten" (Puss in Boots) and immediately had a break-through in this bright and lovable comedy. 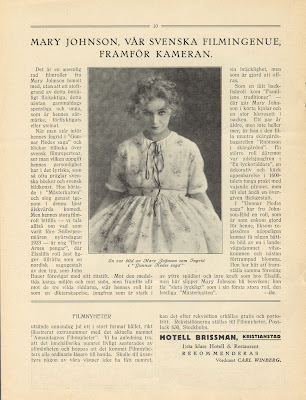 But her big film role to date - we talk about what was before the Stiller première of New Year's Day 1923 - probably is "Herr Arnes Pengar" (Sir Arne's Treasure) where Elsalill's role is arranged as a Nordic fairy-tale figure of the type that John Bauer immortalized with his pencil. In the medieval and barren environment and against the snow, but especially against the three Wild Knights, her role is as a poetic creation, the virgin who is strong in her fragility, but who is made to be sacrificed. As a light minx role came "Familjens traditioner" (Family Traditions) - Mary Johnson wears short skirts and a large Hair Bow in the neck. She is a couple of years older, but not more, in the cheerful archipelago trifle "Robinson i skärgården" (A Modern Robinson). A major role however was the noble maiden in "En lyckoriddare" (A Soldier of Fortune), a decorative and dashing appearance in the 1600's heavy splendor of waving plumes, but in the end still a deserted maiden. In "Gunnar Hedes saga" (The Blizzard) Mrs. Johnson-Röd has a role that is set up as if it was specifically made for her, as the director could hardly get any better image of a in the dust along a country road stray and almost downtrodden flower. She has to make the same association of outer delicacy and inner force of Elsalill, but it will not be disappointing for Mary Johnson; she gets a "happy ending" just as in her first major role, in the festive "Mästerkatten" (Puss in Boots).